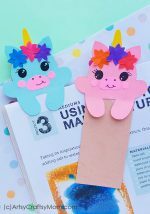 Celebrate the excitement of a new school year with new books, stationery and these awesome Back to School DIY Crafts for Kids to make for themselves or their friends! It’s almost time for the kids to be Back to school in most parts of the world, My kids love it, especially since they’ll get to meet their old friends whom they missed over the summer break. But in my home, the best part of back to school is all the new stuff – who can resist that new-book smell?? It was the same when I was a kid, and so it is with Miss P – guess she’s a chip off the old block! Stores are filled with brand new supplies this time of the year, and to be honest, it’s quite tempting not to buy everything! But none of that can compare to the fun of making some cool stuff for yourself or your friends. So let’s check out some awesome Back to School Crafts for Kids – to make for themselves or to gift their friends! Everyone needs a clipboard; even if you’re not at school! Jot down your notes in style with these insanely easy to make house shaped clipboards from Francois et Moi. I mean, it’s just a board with a clip – how hard can it get? 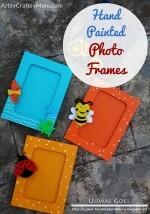 This cute photo frame from I Heart Crafty Things is a great idea for the little ones who’re starting school or going back for their second or third years. Click a pic for every year and display it through the course of that year, and turn it into a photo garland for their college going-away party! If your child is in a Hello Kitty phase this year, add to her collection with these cute Hello Kitty bookmarks. They’re really easy to make, and look so good that you’ll have people asking where you bought them from! Be sure to click and grab your free template. Colored markers and sketch pens look so much better when they’re neatly organized, don’t they? Corral the mess into a bookworm paper roll pencil holder from Easy Peasy and Fun – complete with a little book. With a bookworm that cute, no kid will want to leave their stuff lying around! If your child is more artistically inclined, he’ll love these watercolor bookmarks! Since you can customize them, they also make great gifts to hand out to classmates this Back to School season. Now every time they go back to their book, they’ll smile thinking of their friend! This craft from The Crafting Chicks is more than just a countdown calendar, it’s also a great way to help little kids express their emotions. I think this is particularly useful if your child has had a very enjoyable summer and is finding it hard to adjust to going back to school. When we were kids, we were required to wrap all our books in a certain shade of brown paper and then stick labels on them. The slightly OCD side of me wanted all the labels to match, and I would hunt high and low to get them! But with these printable labels, you can just print as many as you want! Say goodbye to homework resistance with pencil flags that fly high and proud! My Paper Printables has cute little flags that you can print and fix onto your pencils. Don’t forget to make some for your friends! 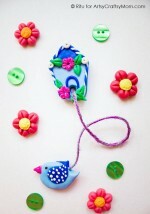 If you’d like something a little different from flags, try out these pipe cleaner birds to top your pencils! What I like about this is that you can use any color combination and add a variety of embellishments like Googly eyes, feathers and sequins to dress up your pencils. In many places, kids give their teachers little notes at the end and start of every school year. If you’d like to give teachers or friends a few words of happiness and inspiration, don’t do it the boring way with plain paper – write it on the back of a Popsicle stick pencil, like this one from Craft Create Cook. Your water bottle is never going to get mixed up with someone else’s again. How can it, when it’s dressed up like a pretty pink dragon? Sew Some Stuff has instructions on making this super-cool dragon water bottle cover – adjust the dimensions to fit your child’s bottle. We’ve suggested the Popsicle pencil to write your notes on, but you can take it a notch higher by writing them on these 3D paper apple books! Hello, Wonderful shows us how to make these adorable little books that will work well with both kids and teachers. Remember how I said I like my school stuff to match? Well, if you’ve printed out our animal school labels, you absolutely MUST print out these matching bookmarks as well! Make separate sets of each animal to gift each of your friends – they’re going to be delighted! If you’re not the label type, here’s something more interesting for you to decorate your notebooks with. Design Eat Repeat has printable fruit stickers that have enough space for you to fill in the details. 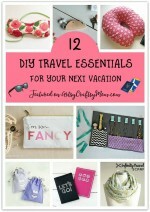 You’ll be hard pressed to find a girl who doesn’t need a pouch for her stuff! Try making these abstract zipper pouches from Pretty Life Girls that are perfect for everything – stationery, makeup or other personal items. If you don’t have a brown-paper rule for your school books, then go nuts with these personalized versions from Design Improvised! The candy colors work well for every season and you can use any combination of colors you like. Have matching sets made for your girl gang to be in sync! Got a Pokemon fan at home who’s got his own Pokemon gang at school? Let Pikachu accompany him as he learns about numbers, grammar and science. It’s always good to have a friend by your side!! Do check out the matching Pokeball magnet also shown in the picture. Turn your messy monkey into a neatnik with this cool Star Wars R2 D2 pencil holder from Crafts by Amanda. This is actually a pretty simple project, and for the younger kids, you can get the pieces ready and leave the assembly to them. We can’t guarantee that those project reports won’t be boring, but we can assure you that the binders you put them will be far from boring! I Heart Nap Time shows us how to make these glamorous Washi Tape Binder Covers that will make class work way more interesting! Finally, if you’ve set up a reading routine during summer, don’t let it lapse just because school has started. 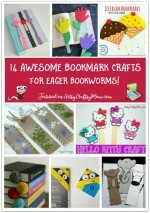 Make a bunch of bookmarks to mark your place in all those amazing books – and keep on reading! So many ideas, I’m sure you’re wondering where to start! That’s okay, think about the child’s age first, and then about his or her interests and what their friends would like. 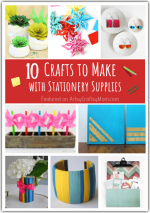 Then bring out all those brightly colored craft supplies and make this school year an awesome one!